Water heating can constitute 15% to 25%, or more, of the energy use of a home. The approximate annual cost to operate water heaters ranges from $300 for a minimum efficiency gas-fired unit to as much as $900 for a minimum efficiency electric unit. Solar water heaters are available that can reduce annual operating costs by 50% to 80% or more using “free energy” from the sun. These systems typically are cost-competitive with electric water heaters and also can be cost-competitive with natural gas-fired water heaters. 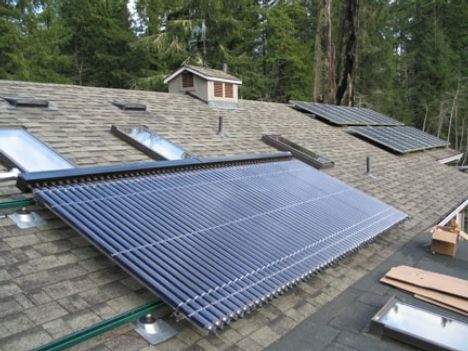 Solar water heaters come in two distinct designs: active and passive systems. In an “active” system, when sunlight heats one or more solar collectors sufficient for water heating, sensors and a controller activate a pump that circulates a fluid: either potable water from the storage tank or a food-grade antifreeze solution in climates exposed to freezing conditions. In many active systems, the solar system has its water storage tank, allowing it to serve as a “pre-heater” for the primary water heater (gas or electric). A “passive” system combines the solar collector and storage in one complete unit separate from the conventional gas or electric water heater storage tank. The storage can be directly coupled to the collector or located above the collector using the natural flow of heated water upwards to drive fluid circulation (Thermo-siphon system). Passive system design requires no pumps or controls for operation as sunlight heats water all day. When hot water is used in the home, water from the passive solar storage tank is drawn into the conventional gas or electric water heater storage tank, thereby avoiding the need for electric or gas-fired heat to turn on. Providing energy-efficient houses with solar water heating systems provides peace-of-mind that homeowners are contributing to environmental stewardship while helping their bottom-line expenses. Collectors are typically installed on roofs; it will be necessary to work with your design team for the desired architectural appearance. This includes strategies to feature them prominently or to minimize their appearance. Note that the latest solar collectors and systems can be integrated with any roofing material to create clean and pleasing lines. In some cases, special framing considerations will need to be addressed. This may include supports for heavier passive solar systems because of the weight of water storage supported by the roof, special flashing details for roof integrated collectors, and pitch pockets or roof vents for plumbing penetrations. Proven installation techniques will ensure that the solar system will not interfere with the integrity of the roof. Additional Plumbing. You will have to make a decision to use your plumbing subcontractor or to hire a special solar installer. In either case, it will be necessary to coordinate the installation of plumbing so that necessary piping can be conveniently installed between solar collectors and storage tanks. Additional Wiring. Active solar systems will need their own wiring for pumps and controllers, and low-voltage sensor wires have to be run from the storage tank to the collectors. Proper Insulation. Solar piping should be fully insulated since heat losses from piping systems can degrade the efficiency of a water heating system by more than 10%. Also, solar water heating systems use extra-thick foam insulation around storage tanks to reduce tank heat loss. Lower operating cost than a conventional water heater. Solar water heating systems typically reduce water heating costs by 50% to 80% over minimum efficiency electric resistance or gas-fired water heaters. When the cost of the solar system is amortized in a 30-year mortgage, the monthly utility bill savings (e.g., $20 to $40) can more than offset the small increase in monthly mortgage cost (e.g., less than $20). This can mean significant annual savings. Renewable energy offers the most direct environmental benefits. Renewable energy sources are the only way to replace directly, rather than simply reduce, the use of fossil-fuel energy. Thus, renewable energy systems such as solar water heaters are our most effective strategy for preventing air, water, and land pollution. They also help our economy and national security by reducing our huge dependency on imported fossil fuels. It feels great as a consumer to participate in a purchase decision that helps the nation and our wallets. Solar systems are subject to national, and sometimes local, standards and certification. Installation can be done by experienced solar or plumbing contractors with no disruption or delay in construction schedules. However, planning, as in all aspects of the home building process, is critical to making this happen. Design Coordination. Solar water heating systems are always used in conjunction with conventional water heaters, either electric or natural gas, to assure ample hot water supply in periods of excessive demand or inclement weather. A friend of mine was telling me that he was getting solar power for his water heater, and I wanted to know how it helps. It’s interesting that it actually doesn’t use antifreeze, but uses the solar panel. It would be nice to have something that will be a little more green.